Kali is a potent healer and enchantress. Her sessions will empower you to let go of all that no longer serves you, release energetic blockages, and step out of the shadows into the light of your true greatness. She is a Yogini, certified Ayurvedic Counselor and Body Therapist, Reiki Level II Practitioner, and has been practicing the Tantric arts as a Dakini for the past 3 years. 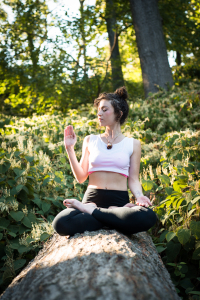 She has studied Thai yoga massage, Lomi Lomi massage, Abhyanga massage, Indian Marma point therapy, crystal healing, essential oil therapy, and Shamanic healing practices. Through this work, Kali desires to abolish the old paradigms of scarcity, of fear, and of shame. By channeling healing to others, serving as a mirror and showing them their infinite beauty, Kali is actively creating a world where abundance, love and compassion reign supreme. Book a Harmony Tantra session with Kali today, and tap into what you already know to be true, that you are infinite in your power, grounded in your sensuality, and limitlessly beautiful!